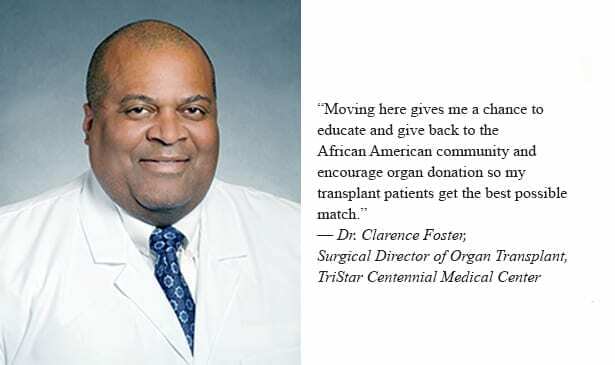 NASHVILLE, TN — Contradicting fears and myths about kidney transplants is critical for Dr. Clarence Foster, Surgical Director of Organ Transplant for TriStar Centennial Medical Center. Because of complications of hypertension and diabetes, African Americans suffer a higher rate of kidney disease which requires dialysis or a transplant. In the past, recipients for a donor kidney were ranked by six criteria that made it harder for African Americans to qualify. Dr. Foster says those criteria have changed for a more equitable assessment. Patients on dialysis for years now move up the list when they qualify for a transplant. Now, those years on dialysis are counted and move the patient up the list. Transplant specialists prefer to match organs like kidneys within the same racial or ethnic group to ensure a close match. This is due to similarities of blood types within those groups. Also, African Americans are more sensitized to transplanted organs and have a metabolism that may require different doses of some medications according to Dr. Foster. “Organs tend to be a better match to recipients of the same ethnicity,” said Jill Grandas, executive director of Tennessee Donor Services in Nashville. The most desirable transplanted kidney is one from a living donor – usually a very close blood relative. However, there are misperceptions among some African Americans around transplants. One fear is that the donor may suffer diminished kidney function or have health problems. “We actually find that a single kidney increases its efficiency very quickly to compensate,” said Dr. Foster. He said that most people function very well with one kidney–both for the living donor and recipient. The other fear stems from what might happen to donors who have signed an organ donor card. A person can donate a kidney after death which is usually taken within a short time of being declared brain dead. “The fear there is that if a patient codes [goes into cardiac arrest] we will take organs too soon or withdraw care. They don’t realize that if we withdraw care, it hurts the organs as well. It is our commitment and oath as physicians to do the utmost to save every patient. We understand the fears among the African American community based on some terrible things in the past, but I emphasize that we do our utmost to save every patient,” said Dr. Foster. Since dialysis and transplants are now covered by Medicare, more minorities are being treated. In 2016, 226 African American Tennesseans received a kidney transplant compared to 222 white and ten Hispanics, according to data from the U.S. Department of Health and Human Services. The numbers are almost identical for 2015. But, the list for Tennessee residents who need kidney transplant is far longer. Last year, 1, 283 African Americans, 1,166 Whites, 63 Hispanics and 29 Asians, 9 Native American and 29 Multi-Racial people waited for kidney transplants. Jill Grandas confirmed that the numbers of African Americans waiting for a kidney are almost equal to white patients. However, in Tennessee, the number of African American kidney donors is far less than the need. Last year, 211 kidneys were donated by white donors, 43 by black donors, 11 by Hispanic donors and 2 Asian donors and these were from deceased donors. Among living donors (usually a close family member) there were 55 white donors, 7 black, one Hispanic and one Asian. “Among, 2,107,231 on the ‘Donate Life Tennessee Organ and Tissue Donor Registry,’ 9.2 percent are African Americans,” said Grandas. “African Americans can safely be a living donor. We need to overcome the mistrust between the community and the medical profession,” said Dr. Foster.